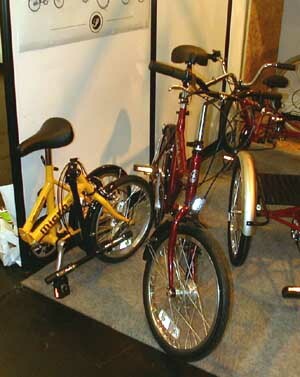 Bike 99 took place from 9-11 April 1999 at the NEC near Birmingham. I visited on the Friday, when it was very crowded and very noisy. I didn't go to the 1998 event, but had been told that it was noisy, so I took ear plugs and was glad to have them. The event seems to be aimed primarily at BMX and mountain biking, the latter having more emphasis on the showy and downhill aspects, rather than general cross country riding. Although the CTC were there, and there were some stands encouraging cycling in Wales, Ireland, Wiltshire etc, there was very little of interest to me, and I suspect most of our members. 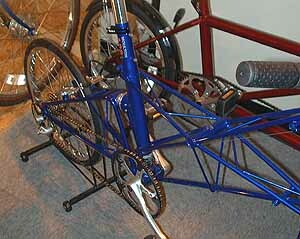 The only folding bikes which I saw were a Micro and FoldIt on the Pashley stand, and in Moulton terms Pashley were showing their prototype FX fixed frame versions, which have eliminated the separation facility. Two models were on show, one the red 4-speed Shimano equipped machine with electronic gear change controls, as seen at Cycle and Leisure recently, and the second a blue machine with a derailleur set up. Both are still prototypes, and no firm plans have been made for going into production - they are being used to gauge customer reaction. I was told that the saving in weight associated with elimination of separation means that the weight can be got down to about 26 pounds, but I think that is with minimal equipment (ie no carriers or mudguards), so although it is a saving it is probably only about 1 or 2 pounds. 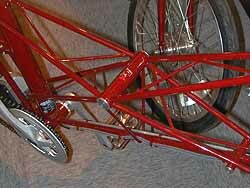 The Moulton/Pashley FX4 prototype (hub geared version, as described in the Cycle and Leisure Exhibition report), showing the fixed frame joint where normal APBs separate. The derailleur geared version of the non-separable APB. This picture also shows more clearly that the lower frame members form a straight line, without the slight dog-leg found in the separable models. This report is being posted early Saturday 10th April. If you are wondering whether to visit Bike 99 today or tomorrow, I'd suggest that as a member of The Folding Society you won't find it very interesting, unless you or your children are keen on BMX and showy mountain bike riding.